Whether it’s storms, earthquakes, wild fires or tsunamis, we need to know what to do, who to contact and how to prepare in case of an emergency. Below you will find resources and contact information to get prepared and stay prepared. Did you know North Saanich, Sidney, and Central Saanich municipalities have joined together to provide public safety alerts to the residents of the Saanich Peninsula? 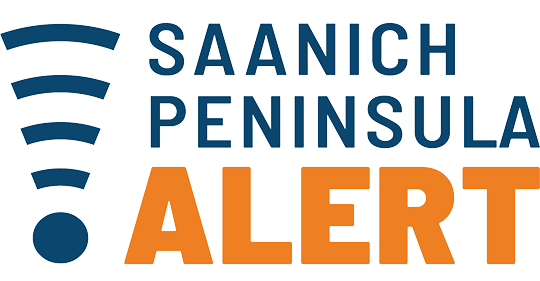 To receive alerts, please register with Saanich Peninsula Alert. Alerts will be sent for events such as earthquakes, tsunami alerts, evacuation notices, or other safety threats. Your participation in this system is voluntary and all information you provide is protected and confidential. NOTE: Any alerts sent over Alert Ready (Wireless Public Alerting System) takes precedence over any notifications sent via Saanich Peninsula Alert. * Facebook pages are community run, please also check for official updates. * Remember, Facebook has the potential to crash just like any site on the internet, so it’s important you connect with your neighbours and learn about your community’s communication plan. Check out THESE communication tips! With regards to general outages, customers are best to visit www.telus.com/outages. B.C. is considered a high-risk earthquake zone, so be prepared to be on your own for a minimum of 72 hours by developing a household plan, putting together your emergency kit and connecting with your neighbours. By planning ahead and practicing drills, you and your family will know what to do. What to do if there is an earthquake? Learn more HERE. Is your Emergency Kit updated and ready to go in case of emergency? See the complete lineup of videos HERE. Help your kids get prepared for emergencies. Teach them about natural hazards like earthquakes, tornadoes, ice storms and blizzards. Make sure they know what to do when they occur. More info HERE.